1317b, Used Rims, 15X7, 5 LUG, 4-3/4", 83-94, CHEVY, GMC, 4X2, BLAZER S10, JIMMY S15, ARGENT, RALLY STYLE, STEEL. 1319a, Used Rim, 15x7, 5 LUG, 4-3/4", 83-94, CHEVY , GMC, Blazer S10, BRAVADA, Jimmy S15, ARGENT, STEEL. B= BLACK, C= SILVER. 1319a, Used Rim, 15x7, 5 LUG, 4-3/4", 83-94, CHEVY , GMC, Blazer S10, BRAVADA, Jimmy S15, ARGENT, STEEL. A= ARGENT B=BLACK C= SILVER. 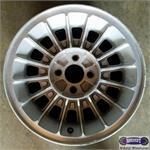 1447, Used Rims,15X6-1/2, 5 LUG, 5", 85-95, CHEVY, ASTRO, SAFARI, PAINTED ARGENT, STYLED STEEL (RALLY). ALSO AVAILABLE IN GOLD, OR BEIGE. 1529a, Used Rims ARGENT, 15X7, 4 LUG, 4-1/4, 87-90, FORD, MERCURY, MUSTANG, COUGAR, 22.4mm OFFSET, 16 SPOKE, ALLOY. ALSO COMES IN GOLD. 3018, Used Rims Ford, 16X7, 4 LUG, 4-1/4", 91-93, FORD, MUSTANG, 22.4mm OFFSET, ARGENT FINISH, 5 SPOKE, ALLOY. 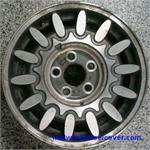 3149b, HUBCAP USED, 14", 89-91, CHEVY, CORSICA, ARGENT FINISH, WEB TYPE 15 POCKETS, LOGO, 10 METAL CLIPS. 3267, Hubcap used, 13", 64, CHEVY, CHEVY II, W/O WIRE TYPE, POLISHED OUTER RING WITH 9 SLOTS, RIBBED WITH 3 POLISHED SPOKES ARGENT PAINTED, CONED CENTER WITH WORDS CHEVY, METAL CLIPS. 3330, Used Rims, 17X7-1/2, 5 LUG, 135mm, 99-00, FORD, LINCOLN, EXPEDITION, F150, NAVIGATOR, ALSO USED AS CONVENTIONAL SPARE, 12mm WHEEL BOLTS 14mm BOLT HOLES, WHEELS WITH 12mm WHEEL BOLTS MAY BE STAMPED 14mm INSET, ARGENT, STEEL. 3393, Used Rims, 16X7, 5 LUG, 135mm, 00-04, FORD, EXPEDITION, F150, 14mm WHEEL BOLTS, 16mm BOLT HOLE, 5 SPOKE, STYLED STEEL, ARGENT. 3393, Used Rims, 16X7, 5 LUG, 135mm, 00-04, FORD, EXPEDITION, F150, 14mm WHEEL BOLTS WITH 16mm BOLT HOLE, 5 SPOKE, STYLED STEEL, ARGENT. 3504b, Used Rims, 17X7, 5 LUG, 4-1/2", 03-05, LINCOLN, TOWN CAR, 14 SPOKE, ARGENT METALLIC PAINTED, ALLOY. 3554b, CENTER CAP USED, 04-08, FORD, F-150, ARGENT SPARKLE SILVER FINISH, 5 INDENTS MATCH SPOKES, BLUE FORD OVAL. 6 LUG NUTS CLIPS, 7" DIA. 3621, Used Rims, 17X7-1/2, 8 LUG, 170mm, 05-10, FORD, F250SD SRW, F350SD SRW, ARGENT, 5 SPOKE, STEEL. 3630, Used Rims, 16X7, 5 LUG, 4-1/2, 06-08, MERCURY, GRAND MARQUIS, 16 SPOKE, MACHINED ARGENT FINISH, ALLOY. 4001, CENTER CAP USED, 91-96, BUICK, PARK AVENUE, PLASTIC, DARK ARGENT, 5 LUG HOLES, CHROME RING, THREE FLAGS RED, WHITE & BLUE, BOLT ON, 11" DIA. 4001, CENTER CAP USED, 91-96, BUICK, PARK AVENUE, PLASTIC CAP, DARK ARGENT, 5 LUG NUT HOLES, CHROME RING, THREE FLAGS RED, WHITE & BLUE, BOLT ON TYPE, 11" DIA. FOR A 15", RIM. 4026, Used Rims, 15X6, 5 LUG, 115 MM, 97-01, BUICK, LESABRE, 21 POCKETS, ARGENT FINISH, OPT PF7. 5063a, Used Rims, 15X7, 5 LUG, 4-3/4, 98-05, CHEVY, GMC, BLAZER, JIMMY, S10, S15, SONOMA, 5 SPOKE, MACHINED POLISH FINISH, ARGENT ACCENTS, ALLOY. 5066, Used Rims, 15X6, 5 LUG, 115mm, 98-99, CHEVY, MALIBU, OPT PF7, 9 SLOT, MACHINED FACE, ARGENT POCKETS, ALLOY. 5128a, Used Rims, 16X6-1/2, 6 lug, 5-1/2", 99-08, CHEVY, GMC, ASTRO, VAN, SAFARI, TAHOE, P/U,1500 SIERRA,SUBURBAN, SILVERADO, 5 SPOKE, ARGENT PAINTED STEEL. B=BLACK. 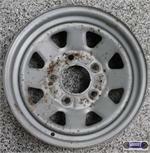 5155, Used Rims, 15X6, 5 LUG, 100mm, 03-05, CHEVY, CAVALIER, OPT PF7, ARGENT FINISH, 5 SPOKE, ALLOY. 155, Used Rims, 15X6, 5 LUG, 100mm, 03-05, CHEVY, CAVALIER, OPT PF7, ARGENT FINISH, 5 SPOKE, ALLOY. 60160, Used Rims, 15X5-1/2, 5 LUG, 5-1/2", 90-95, GEO, SUNRUNNER, TRACKER, 6 SLOT ARGENT FINISH STEEL. 6034, Used Rims, 15X6, 5 LUG, 115MM, 99-01, OLDS, ALERO, OPT PF7, ALUM 6 SPOKE WITH INDENT IN EACH SPOKE, SPARKLE SILVER (ARGENT). 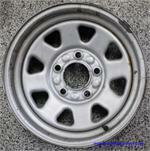 63688L, USED RIM LEFT, 14X5-1/2, 4 LUG, 100MM, 88-89, HONDA, ACCORD, LXI, 3 & 4 DOOR, EMKEI MFR, ALUM, ARGENT, 12 POCKETS.